Basically, in this video, I play a character called “Howard.” This is a character who is not me. His name is Howard, and also he doesn’t look like me. I don’t have a mustache or long hair, because those are the things that Howard has—for the character. I had long hair in Conan once, but that was for another character in a movie. Conan was also not me. In this video the mustache and hair are fake, because I put those on and everyone will see those and think, “Who is this man? He looks physically very strong and fit, like maybe he’s Arnold Schwarzenegger. But he has a mustache, so he must be someone else.” And that is because he is Howard. But really I am Howard, which is the amazing thing we find out later on. We went to Gold’s Gym, because this is where I trained when I was a bodybuilder, and I knew it would be easy to get a camera crew in there, because they know me. They don’t know Howard, but that is part of the joke. But you'll see. This is also funny because I have a mustache, like criminals have. The video is all to raise money for after-school fitness programs, which are very important and not a joke to me. 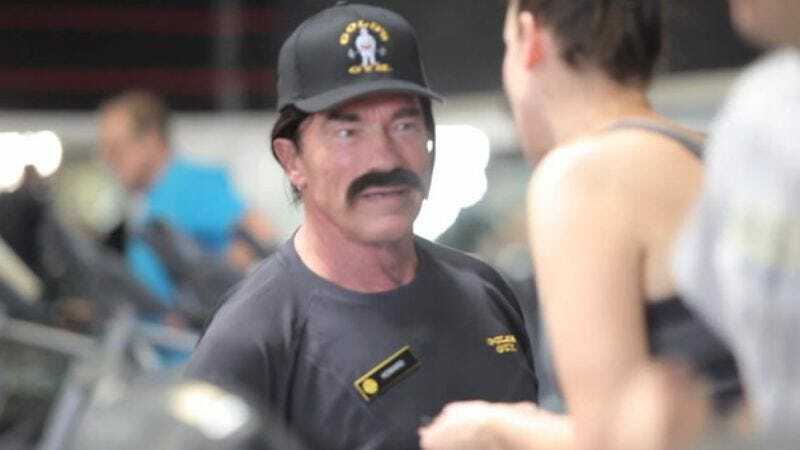 But sometimes you have to make a joke to get people to look at it, like maybe you put on a mustache and pretend that you are not Arnold Schwarzenegger for a little while. That is why I like to be in movies.